Sooji Halwa is a very popular sweet dish all over India and is made on religious occasions, as prasad (offering to God). After prayer Halwa is served to devotees as a blessing. We call it sheera also. 1. Put a pan on the flame, and pour water into it. let it boil well. 2. In a heavy bottom pan, heat ghee and add sooji and roast it by constantly stirring. 3. Roast it till the sooji is aromatic and light brown in color. 4. At this stage, add the hot (boiled) water in it. Be careful while doing so as the batter will sizzle. Don’t burn yourself. 5. Then put sugar in it. 6. Put a pinch of salt in it. 7. Cook till the water dries a bit and the halwa starts to leave ghee on the sides. 8. Heat one more tablespoon of ghee and roast the nuts and raisins. 9. Add these roasted nuts to the halwa and serve hot. 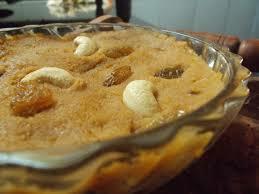 You can also make burfi from this sooji halwa when the halwa remains. 10. Grease the tin and put the halwa in it.set it for one hour or keep it into the fridge. 11. And then cut it into small pieces. It also tastes so nice. so many variations can be done from this halwa. As you want, you can do it. 12. Or you can also make sweet sooji halwa paratha from it.